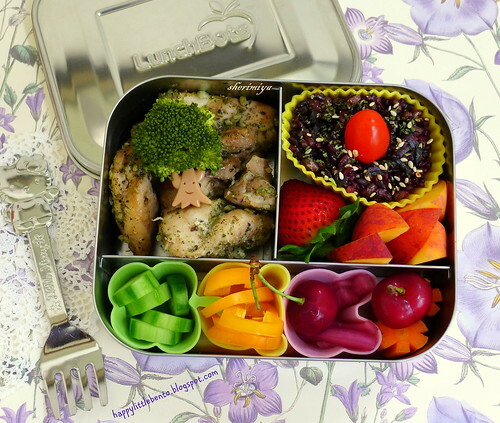 Herby Chicken Lunchbots Bento, a photo by sherimiya ♥ on Flickr. Here's the last bento for the week: and it's good old chicken and rice. I loved this combo when I was a kid, and my kids kind of do too, minus the rice. Sigh. But I find that they will grudgingly eat rice with furikake (and also in hot dog maki, fried rice, sticky rice, or jook), so I put a cup of it in here. This rice is black rice and pearl barley. I disguised it as a cupcake with a tomato "cherry". The chicken is just garlicky herbes de provence olive oil chicken, oven baked. I made more kale chips tonight, which didn't survive for bento extras. The rest of the LunchBot Trio holds a variety of pickled stuff, carrots, cherries, strawberry and baby peach. Oh, and a broccoli tree. Have a great day! Garlicy herby chicken sounds winning indeed! LOL re the kale chips...I must make those some day! Oh the chicken looks terrific! Even cold chicken tastes really good when it is seasoned with garlic and herbs... Delicious bento! It's so true Nami! It's what I love about chicken in bento. It's nice to have a change from shoyu flavor once in a while too :) Thanks a lot Nami!